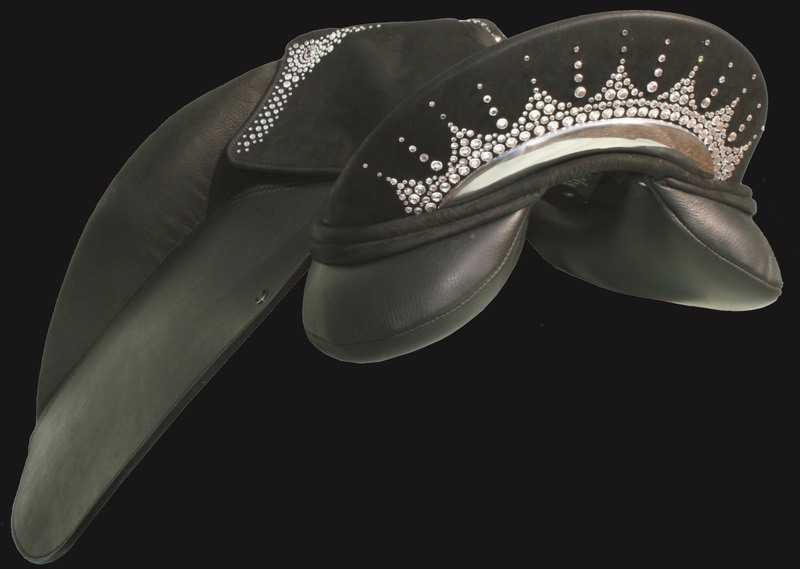 Why not ‘bling up’ your saddle? The Club vs the Competitor… what are the differences? It all started with the WOW Competitor Range. For the first time one could buy a traditional looking saddle and by buying different components, alter all of its’ characteristics to suit different horses, riders and disciplines. WOW is the world’s first modular saddle. The seat, panels and flaps of the WOW Competitor Range are all available separately, so you can easily change component parts. When they are combined they make a saddle whose performance for the horse and the rider is unbeatable! Flexible Carbon Fibre Tree. Using the latest materials to give the ultimate in flexibility and strength. Lateral Flexion allows the horse to rotate the scapula fully under the saddle without interference, whilst also proving a very big bearing surface and hence very low pressures on the horse’s back. PPS™ “Pointless Panel System” The unique shape of the tree with no conventional points and an extended floating plate on the panel top produces a bearing surface larger than a western saddle! Double Stirrup Bars Allows the rider to ride with both a straighter leg position for schooling and a more forward leg position for hacking or jumping disciplines. Adjustable Tree Width The width of the tree can be adjusted by the rider using the unique Flexi-Head™ in conjunction 11 interchangeable headplate width fittings from extra narrow to 8X Wide. Double Wishbone Girthing A unique girthing arrangement centers the pull of the girth to keep the saddle still and stable on the horses back. Two position flaps All flaps have two fixing positions so you can change the flap’s angle forward or back as well as removing them totally. This allows for riders with longer leg/thigh length. Choice Of Seat Designs Flat to deep with differing degrees of softness of support. 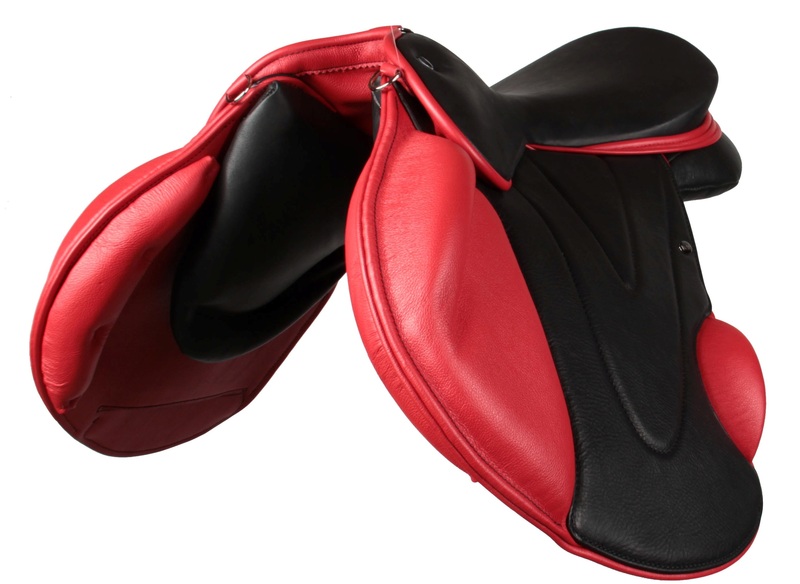 Anatomically Designed Seat Allowing the rider to achieve total closeness to the horse with their thigh lying flat against the horses side. Choice Knee Blocks Fixed Blocks or Moveable Blocks. moveable blocks allows the rider to adjust the knee support. 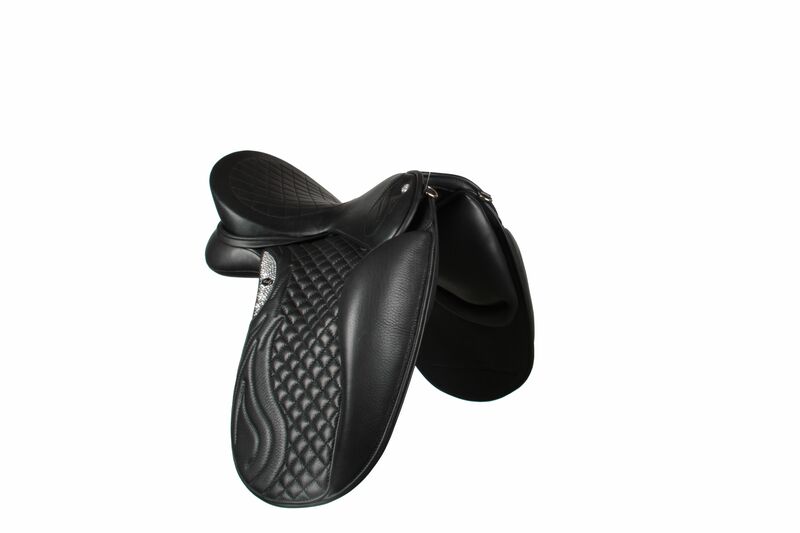 Single web stirrup leathers included so there is no buckle under the rider’s leg and Flair – The Adjustable Air Flocking System is fitted as standard. Flair allows the panel to be adjusted to and continuously mould to a horses changing/moving shape. There is a choice of colours and styles of leather, stitching and facings as well as flaps, panels and seat allows the rider to customize the saddle to their own preferences. The WOW Club Dressage shares the same tree as the Competitor and has the same range of headplate fittings. 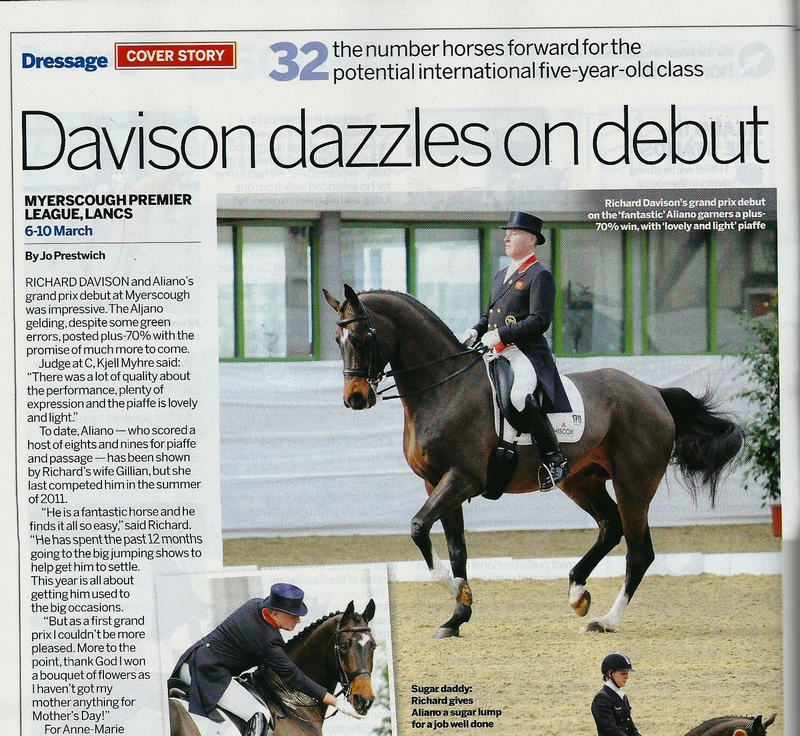 The WOW Club Dressage cannot change flaps or seat and is just a dressage saddle. The Panels of the Club are inter-changeable and come fitted with a foam panel as standard, this can be upgraded to Flair. The colours for the WOW Club Range are limited to black and brown. Innovative saddle manufacturers, First Thought Equine, have launched The WOW Bounty – a beautiful, technologically-advanced dressage saddle with a deep profile seat designed to offer supreme support and comfort for the larger rider. The WOW Bounty is specially designed to cup the rider’s seat and provide ultimate support. It offers the horse supreme comfort, with the famous WOW carbon fibre tree that provides lateral flexion, and the Flair Air Flocking System that consists of four adjustable air bags that provide an even bearing surface for optimum equine comfort and enhanced performance. Meanwhile, WOW’s Pointless Panel System increases shoulder movement, and interchangeable steel or carbon fibre headplates, available in 11 sizes, offer the perfect equine fit. The seat can be used with the full range of differently designed flaps in the WOW range be it fixed or moveable knee blocks, giving the ultimate in rider comfort and stability. The WOW double stirrup bar enables the rider to move leg position, depending on the length of their upper thigh and the level of work their horse is achieving. A range of black and brown colours is available. “We are thrilled with the response to this saddle – and have recognised a market demand from our customers,” David concludes. What does your horse want from a tree? In developing the WOW Saddle we asked ourselves this question… what does your horse want from a tree? The answer is a means to distribute the rider weight symmetrically and evenly from the 7th to the 18th vertebrae. This means there should be no flexion in the tree front to back. A lot of companies purport to having flexibility in their trees. If there is flexion along the spine of the horse then this will allow the riders weight to bear unevenly or put another way, to concentrate the pressure directly under the riders seat bones over a area no bigger than 3-5 vertebra. This is not a good situation and is verging on removing the tree altogether which gives even worse results in concentrating pressure under the rider seat. However, as a horse moves, its’ shoulders need to find more space as the scapulas rotate back under where the tree sits. The answer is to let the head of the tree swing from side to side as the alternate shoulders rotate back under the tree. In other words, a horse would want a saddle that is longitudinally rigid and laterally flexible in the head. This is exactly what the WOW tree provides. By the use of a “Y” bar made from rigid Carbon Fibre that is as strong as steel embedded in the body of the tree we have created a framework that will move with the horse not against it! WOW was developed after listening to riders and investing time to scientifically test different types of saddles to see how they perform on different horses. This is where the name came from, when our guinea pigs rode in the saddle they said just one word, WOW! WOW is also totally new way of owning a saddle. For the first time one can buy a traditional looking saddle and by buying different components, alter all of its’ characteristics to suit different horses, riders and disciplines. WOW is the worlds first modular saddle meaning that it is a long term investment for your horse. The Pointless Panel System, that provides a wide bearing surface without no pressure points. Perhaps 2013 will be the year that you say WOW?